Discover the martial side of Tai Chi with this very exciting collection. After you learn a solo Tai Chi form, done some Pushing Hands, and have become proficient, it may be time to go to the next level. You and your Tai Chi practice partner are in for a real treat. Dr. Yang shows you how martial movements flow right from the techniques in the Yang-style long form. Your will break down the form and test each technique as it was intended. Included in this collection is a rare two-person Tai Chi sequence! With a little pondering, other Tai Chi stylists will find their martial techniques easily. Bundle contains 3 DVDs. The long-awaited applications of Tai Chi video by Dr. Yang. The most requested title YMAA has ever published. Tai Chi Fighting Applications for all Tai Chi styles. This program offers practical martial applications for each of the 37-postures of traditional Taiji, based on the forms passed down by Yang, Ban-Hou. Once the viewer has a basic understanding of these universal principles, you may use them to devise further applications for every movement no matter which style of Taiji you practice. Learn the Basic Concepts of Taiji and Taijiquan. Understand the purpose of every Taiji movement. 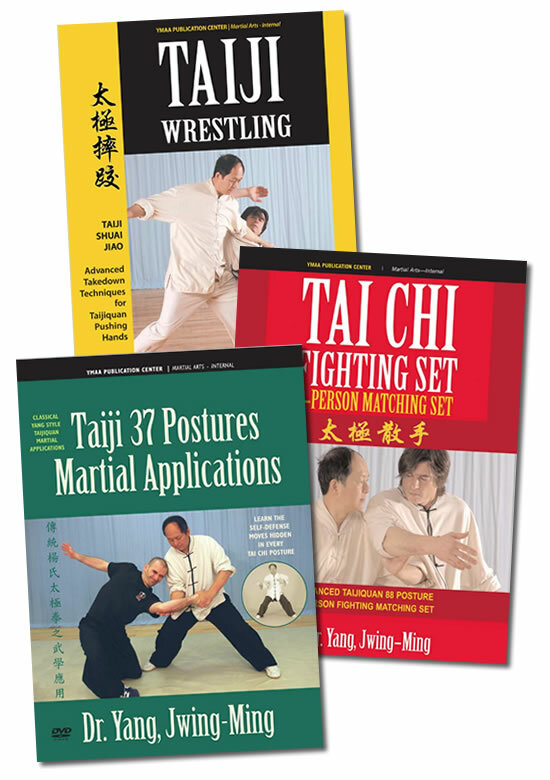 Over 50 effective applications for any Taijiquan style. Dr. Yang, Jwing-Ming comprehensively instructs and demonstrates the 88 Posture, 2-Person Fighting Matching Set for advanced Taijiquan (Tai Chi Chuan). This Fighting Set is a combination of techniques from pushing hands and the solo Taijiquan sequence, and it serves as a bridge connecting pushing hands with real fighting. Like pushing hands, it teaches you how to sense your opponent’s actions and intentions, and it also teaches footwork and how to set up your strategy, making your fighting skill more realistic and alive. Anyone who is proficient at a solo Tai Chi sequence and pushing hands should be able to learn this fighting set easily, and make it part of their practice routine. Dr. Yang, Jwing-Ming instructs Taiji Wrestling applications that can be found within all styles of Taiji, utilizing leg sweeping, tripping, bumping, throwing, and many other techniques.